ELA Container Offshore GmbH has recently delivered three ELA Offshore Multipurpose Rooms on the MPI Enterprise, an offshore construction jack up vessel. The vessel, which is designed to transport, lift, install and decommission components such as jackets, monopiles, wind turbines and transformer stations, has been contracted to complete a turbine installation project including monopiles. 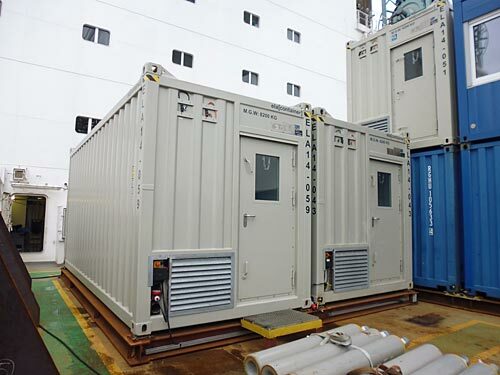 The ELA Offshore Containers are equipped as Office containers and will be used during the offshore transportation and installation of turbines on an Offshore Wind Farm. The containers are expected to be used until July 2017 and are equipped with tables, whiteboards, cabinets, chairs, fire extinguishers and trash cans as requested by the client. These containers will offer employees the best possibility to work offshore while still feeling at home in well-designed containers with wooden details in the interior. “Thanks to their ISO 20 ft High Cube dimensions and plug & play system, lifting and installing the containers is very easy. Hence the reason why the client chose to install the containers themselves’’ says Frank ter Haak, Business Development Manager at ELA Container Offshore. In addition, all containers are delivered with a technical handbook, explaining the electrical outfitting of the containers and enabling a smooth connection to the board system. ‘‘If assistance during assembly or disassembly is required, ELA technicians will be able at any time to assist during installation in any on- or offshore location in the world,” continues ter Haak. Within 10 days after the purchase order ELA Container Offshore was able to deliver the containers to the mobilisation port, where they were installed on the vessel. In addition, parent company ELA Container GmbH has also provided onshore containers for the companies in the mobilising port. Hence, the ELA Container Group worked closely together to offer an “all-in-package” both on- and offshore to satisfy all needs and requirements of their customers. Thanks to good communication between ELA Container Offshore and the client, delivery went smoothly and the containers are currently being used during the installation project, both on- and offshore.